Local 33-Unite Here demonstration in New Haven on Monday, May 22, 2017. 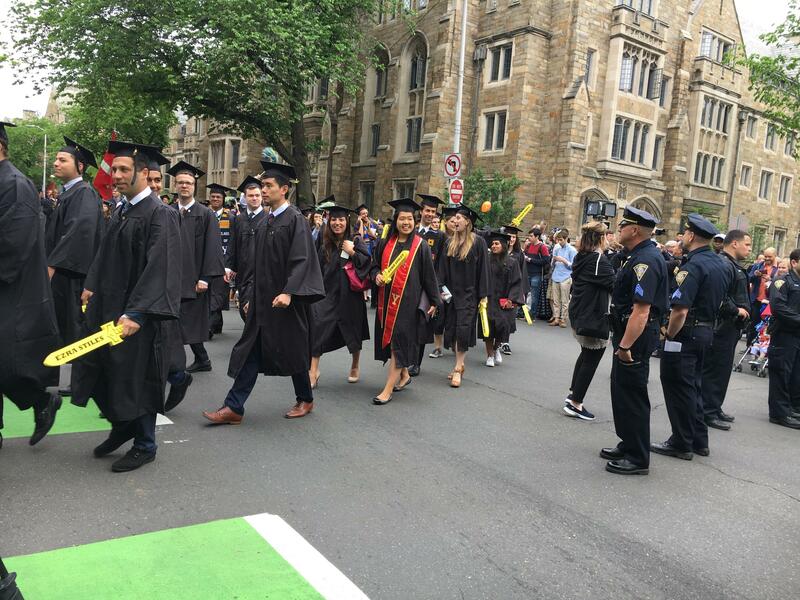 A group of Yale University graduate students and union supporters held a protest on Monday during graduation proceedings. They want Yale to begin contract negotiations with graduate teachers in eight departments that voted to unionize. Some 1,500 marchers wore graduation caps and orange t-shirts. They carried signs saying, “Just the beginning, Yale” as they protested against the university’s decision not to begin contract negotiations. It’s one in a series of staged protests in the past month. The first was a hunger strike. Aaron Greenberg is chair of Local 33-Unite Here, and is one of the original fasters. He said they came out to congratulate the students, and to send a message to Yale. "Yale is accountable to members of its community," Greenberg said. "We won union elections in February. The university is refusing to negotiate with us. And we’re saying: that’s not right; that’s flouting the law, and we’re here today to hold the university accountable." The university questions the process by which the union organized its eight departments, and is asking the National Labor Relations Board to review the matter. Commencement at Yale University in New Haven on Monday, May 22, 2017. The Yale graduate teaching assistants broke their fast following the demonstration. The protest was well-organized and peaceful according to police. But some parents, like David Jacobson from Providence, Rhode Island, weren’t too enthused. "I sympathize with their cause, but it’s an important day for us and I wish it wasn’t marred by protests," he said. "I understand that it’s the big bang for the buck for them, but I wish there was another way they could do it." The New Haven Police Department -- along with Yale police, a traffic unit, and the fire department --participated in the effort to help keep order during the ceremony and the protest. Eight graduate teaching assistants at Yale University have begun a hunger strike in an attempt to force the school into union contract negotiations. A candlelight vigil was held Tuesday night for eight graduate teaching assistants at Yale University that began a hunger strike a week ago. The students started fasting in an attempt to pressure the university into union contract negotiations. Emily Sessions had just started a new semester teaching art to Yale undergraduates, when she was told that her teaching load would be doubled, but her pay would remain the same. More than 1,000 graduate assistants at Yale University are calling for a process to decide on unionization.